Computer Programmer Mason Trellis thought he had problems with corporate nepotism. 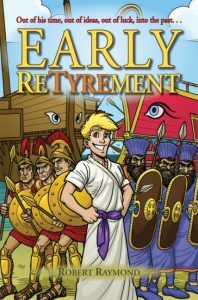 When an experimental laser punches him 2400 years counterclockwise to the ancient port of Tyre, he discovers greater problems (namely ignorance of metallurgy, chemistry, explosives, history, or even the date of a convenient eclipse). Now laboring in a wineshop, he’ll have to think hard and fast to come up with a way out of slavery and into wealth, power and the arms of the lovely daughter of a high Persian official, all before the war between Greece and Persia destroys this eastern Mediterranean city.